"After a long period of time at RAF Waterbeach (see Part 2 of this series) 1651 Heavy Conversion Unit was ordered to vacate that airfield to make way for a Lancaster squadron. On 19 November 1943, therefore, the first members of 1651 CU arrived at Wratting Common, and within three days the whole unit and its Stirling aircraft, which had begun to make the journey as early as 5 November, had arrived. It was found that accommodation for ground instruction was better than at Waterbeach, but bad weather during the first few days prevented much activity in the air. However, Stirling R9159 managed to succumb to engine failure on landing on 23 November and crashed into a Nissen hut near the control tower, luckily without any injuries being suffered. The task carried out by 1651 CU and other units of this type was to convert newly-trained crews from Operational Training Units onto the type of aircraft they would fly on operations. The monthly target output from 1651 CU at this time was 32 crews, and, provided weather conditions and serviceability allowed, this figure was attainable. Unfortunately the weather in December 1943 and January 1944 was poor and on many days did not allow flying. The weather may also have contributed to a spate of minor accidents. On 13 December, for example, Stirling W7619 experienced a burst tyre on take-off, swung badly and ran across the airfield for half a mile, and on 5 January 1944 another Stirling crashed on take-off due to failure of the controls, luckily without injury to the crew members. Flying was also cancelled during the early part of February 1944 due to continuing bad weather. A more spectacular accident occurred on 11 March; while Stirling LK52O was being refuelled it caught fire and was burnt out. Two refuelling vehicles and a David Brown tractor were also destroyed in the blaze but there were no reports of injuries. Early April 1944 again brought poor weather and what little flying 1651 CU was able to carry out had to avoid the many visiting aircraft which appeared at this time, including Dakotas towing Horsa gliders. Servicing Wing personnel benefitted from the weather problem, however, and were able to devote more time to their job of keeping the Stirlings airworthy. Later in the month an increased number of fighter affiliation practices were carried out with the Hurricanes of 1688 (Bomber Defence) Training Flight from Newmarket. In May 1944, with the invasion of Europe imminent, the target output was raised to 4 crews per month. This figure was attained, probably due in part to the better weather, but not without a heavy strain being put on Servicing Wing. A 12% increase in the number of technical personnel had been sanctioned to help meet the required output but no extra men had turned up! A severe shortage of tyres persisted, and caused a wastage of manpower through constant wheel-changing. June 1944 saw 37 crews complete their conversion training and move on to operational squadrons. Flying hours that month totalled 1566 and there were 141 affiliations with the Hurricanes from Newmarket. Difficulty was experienced in obtaining the services of other airfields for 1651 CU's Stirlings to visit on navigational and other exercises, and the weather did not help. Servicing staff were still finding it difficult to keep up with the needs of the Training Wing planners. The situation eased somewhat in July, and the pressure was really put on to train as many crews as possible. Sadly, two major accidents occurred at this point. On 15 July, LK565 of 'D' Flight crashed near Wendens Ambo in Essex after suffering total loss of control, and completely burnt out, killing all eight on board, while on 28 July LJ451 experienced complete engine failure while flying over the Fens. 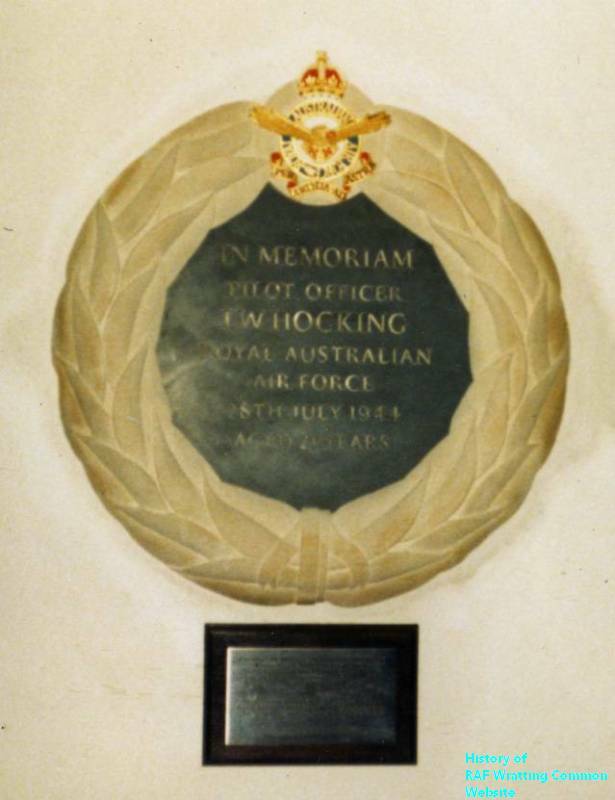 All the crew members baled out except the Captain, P/O Hocking, who was killed when the aircraft crashed a mile west of March. The end result of July's hard work was 48 crews trained in 2009 flying hours, a wonderful effort. The momentum was maintained for the remainder of 1651 CU's time at Wratting Common. Thirty-two crews converted in August in 1698 flying hours, and a further forty in September, by which time all the Stirlings on the unit were of the Mk. III version. The September weather was not good, and flying was cancelled on twelve days and seventeen nights, which makes the end result even more praiseworthy. Flying was again restricted during October 1944, the weather being the worst for some time, and tyres and magnetos were still in short supply, but the output was again forty crews. By this late stage of the war, the Stirling was obsolescent, and the decision was taken to re-equip 1651 CU with Lancasters. 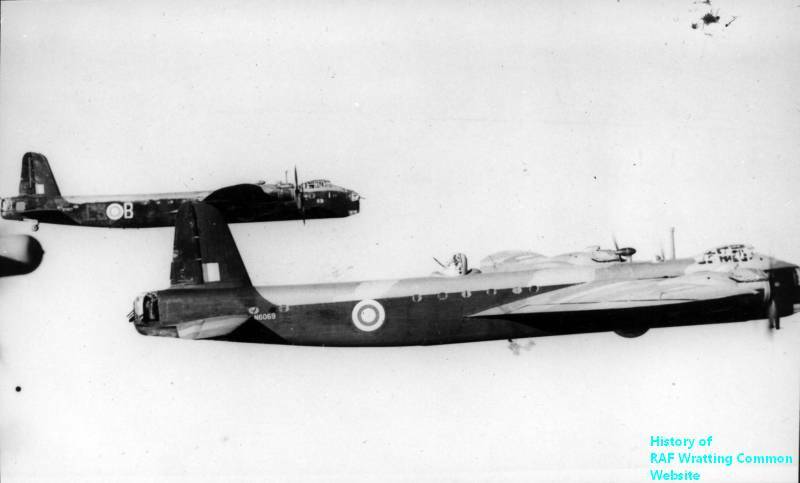 As Wratting Common was required for an operational Squadron once more, 1651 CU was ordered to move to Woolfox Lodge in Rutland, and to leave the Stirlings behind for disposal. The first fifty men and an officer left for Woolfox Lodge on 1 November 1944, another 54 men and an officer on 6 November and the main party in three groups on 10 November. So ended a year of intense activity and some great achievements for 1651 Conversion Unit." The above text is excerpted from the book,"The Royal Air Force in Cambridgeshire, part 3", co-authored by Ron Pearson & John F. Hamlin, published in 1989. Ron Pearson wrote the part covering Wratting Common, which has been reproduced here with his kind permission. A copy of this book can be found in the Imperial War Museum, filed as copy no. 89/1138.